During CES 2018, I was introduced to crazybaby™, a company that has an eye-catching sense for personal audio design. Meet crazybaby’s latest release–the Air by crazybaby ⁽ᴺᴬᴺᴼ⁾ which are strikingly colorful true wireless stereo headphones. Available in 10 different colors, the Air by crazybaby ⁽ᴺᴬᴺᴼ⁾ feature HiFi sound, Bluetooth 5.0, an in-ear mic, and a charging pod. During CES 2018, I was given a prototype to take for a spin and have been using them exclusively for the past month and a half. Let’s take a look at my initial thoughts. The Air by crazybaby ⁽ᴺᴬᴺᴼ⁾ packaging is sleek and extremely reminiscent of Apple packaging. A pill-like charging pod, or Capsule, houses the earbuds and uses a USB-C type connection for charging as well as a discrete battery indicator. Opening the Capsule reveals the earbuds which magnetically snaps into the case. 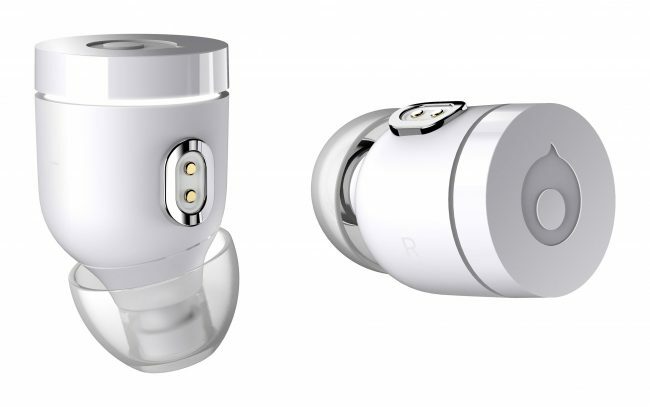 While the earbuds are housed within the Capsule, they pulse to indicate that they are charging. According to their documentation, the charging pod will provide up to nine hours of power while the earbuds themselves hold up to three hours which is actually on par with my usage. Also included are three different sized pairs of ear tips as well as two pairs of wingtips that can be used for sports or the gym to ensure a more secure fit. I found it easy to find a pair of ear tips to fit my ears and I actually didn’t need wingtips while using the earbuds at the gym. Typically while running and moving around with my usual pair of headphones, I often found myself having to rearrange the earbuds constantly throughout my workout. However, with the Air by crazybaby ⁽ᴺᴬᴺᴼ⁾ earbuds that wasn’t an issue. Using the Air by crazybaby ⁽ᴺᴬᴺᴼ⁾ earbuds do take a bit to get used to. Since the earbuds are controlled through various presses on each bud, it’s just a matter a learning and remembering what action each press performs depending on the earbud. With all of the available actions, the only ones I found a little awkward were the playback related actions since those require multiple presses. I often felt like I was just pushing the earbuds deeper into my ears and instead often found myself just using my smartphone for controlling playback. Another drawback was the phone call quality. Since I’m an extremely low talker, anyone I spoke to during a call with while using the earbuds often complained that they were not able to hear me. This might not that big of an issue for me since I try to limit my phone call usage while traveling but it might be an issue for some. I can also imagine this being an issue on extremely windy days. Turning off the Air by crazybaby ⁽ᴺᴬᴺᴼ⁾ earbuds is as easy as placing them back into the capsule case. Then when you’re ready to use the earbuds again, simply pull them out of the capsule and check the indicator light. If they are blinking, then press the left earbud once to refresh the Bluetooth connection. If there is no light indicator, then you’ll have to power on both earbuds in order for the Bluetooth connection to refresh. To be honest, I’m obsessed with my Air by crazybaby ⁽ᴺᴬᴺᴼ⁾ earbuds even for a prototype. They are so compact and deliver a better sound than other wireless headphones I have been using. They are especially a favorite for the gym since they are completely wireless and offer a secure fit. Additionally, crazybaby’s Super Fuel Technology allows a 5-minute charge to provide 1.5 hours of music playback which means the music can keep going for a little while longer. Originally priced at $129, it seems that the Air by crazybaby ⁽ᴺᴬᴺᴼ⁾ earbuds is actually available now for $99, which is an absolute steal. To learn more about the Air by crazybaby ⁽ᴺᴬᴺᴼ⁾ earbuds as well as where to buy, simply check out their IndieGogo page right here. †Product was provided by crazybaby during CES for evaluation purposes. Sony WH-1000XM2 Noise-Canceling Headphone ReviewSquare Enix’s ‘Gravel’: An off-roadin’ simulatin’…racer?